They said it could not be done.. I did it! As I drove on the motorway I tend to glance at car transporters.. but then I am a ‘geeky’ sort of guy.. until I noticed many motorists glance at car transporters when passing as I did. I had this question – why do car transporters carrying motor cars on the motorway in front of motorists in the ‘motoring moment’ do not carry advertising to accompany the car transporters and cars – for example: Vauxhall car advertising while carrying Vauxhall cars? I asked this question to a major car transporter company in Birmingham and was told ever since car transporters were created the vehicle contractors have tried to get advertising onto car transporter but for more there are numerous criteria to address to resolve the problem – for example how do you change the advertising when the cars are dropped off and new cars uploaded. You cannot carry ford advertising with Vauxhall cars. then there is the elements to contend with, access to vehicle when carrying advertising and numerous other problems to deal with. I was told ‘it cannot be done’. Numerous companies and manufacturers had tried over the years and failed and some with costly repercussions. I swear within 60 minutes I had a solution and basic design done in the car on a notepad. I then spent a month locating the right engineering company to create a prototype and a car transporter company to enlist the help of their vehicles and collaborate (Richard Lawson, Scotland). I spent a year developing the solution and engineering, testing, more prototypes until we were ready for full on-road tests. The full story is interesting and full of drama. The project had many obstacles to overcome to get this project a reality and on the road.. but I did it. History had been made. 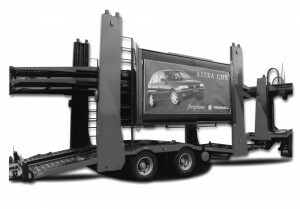 HighRoad Advertising (HRA) – The world’s first car transporter advertising media system meeting EVERY vehicle, environmental, service and driver criteria – the solution. They said it could not be done – I did it. In the photo you see the world’s first car transporter advertising system not only on a maiden run from Stoke-on-Trent (Staffs) to Purfleet (Kent) but then into successful 30 days full service trials out of the Richard Lawson Hartlepool Depot. I will also add the video of the prototype run in due course.